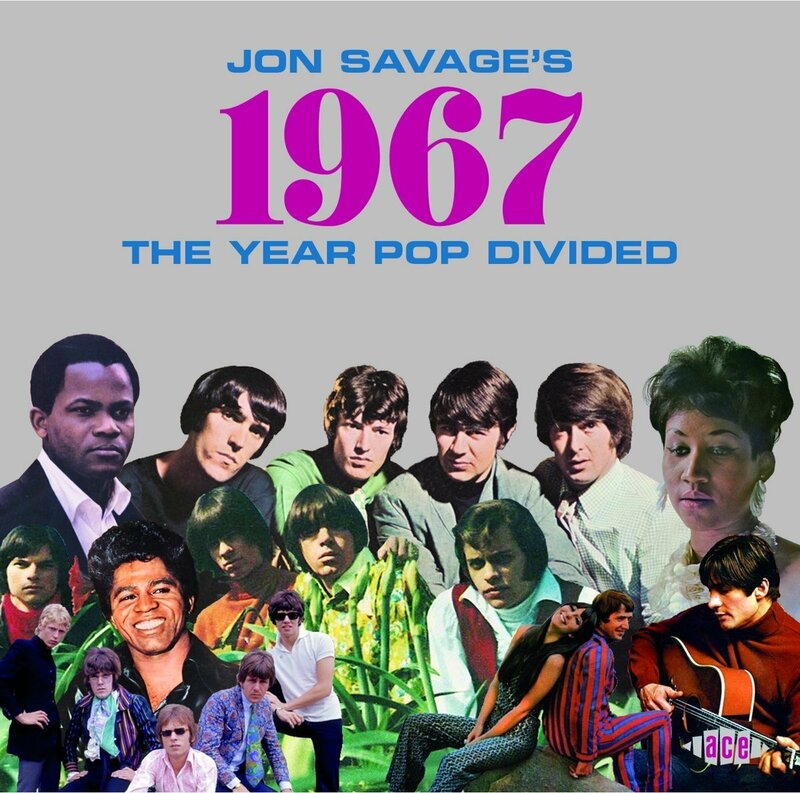 '' Now typified as the year of flower power, 1967 was the year the 60s divided. During those 12 months, the revenues from LP sales in Britain finally overtook those from 45s. It’s also the year when the British singles charts suddenly revealed a vacuum that, in March 1967, was filled by a Top 10 that included Englebert Humperdinck, Petula Clark, Harry Secombe, Vince Hill, the Seekers and other mums and dads records that you will not be hearing on this compilation. Nevertheless, the single was still king … just. It took a while for albums to take over – this happened with the massive success of “Sgt Pepper’s Lonely Hearts Club Band” in the summer. Although outlawed on 14 August 1967, the Pirate Radio stations were still operating for much of the year, with their highly eclectic playlists: soul was rampant, and many psychedelicised acts still felt compelled to pour all their ideas into three or four-minute symphonies for the kids. The album might have been growing in popularity as a format but it was still in its comparative infancy. In 1967, singles cost 7/6d and albums 32/6d – a significant difference to many consumers that brought down volume as opposed to income sales. There were only four UK#1 albums during 1967: “The Sound Of Music”, “Monkees”, “More Of The Monkees” and “Sgt Pepper’s Lonely Hearts Club Band”. In the US there was a similar split: only seven albums, including three by the Monkees and one “Greatest Hits” by Diana Ross & the Supremes. The transatlantic split had begun to deepen, with America firmly in the driving seat. The UK chart might have been dominated by a succession of dreary ballads at #1 (‘Release Me’, ‘The Last Waltz’, ‘Silence Is Golden’, ‘Let The Heartaches Begin’, etc) but the US had chart-toppers such as ‘Light My Fire’, ‘Respect’, ‘Groovin’’ and, god bless the Strawberry Alarm Clock, ‘Incense And Peppermints’. The British equivalent of psychedelia had less of a look in at the top but resulted in fabulous Toytown hits like Simon Dupree’s ‘Kites’ and Traffic’s ‘Hole In My Shoe’. The big trend might have been the Love Generation and the new pop centre San Francisco, but beyond this illusory unity, however, pop was split into all sorts of factions – reflecting events in the outside world: severe race riots in the US (in Newark, Detroit, Buffalo, Milwaukee and Minneapolis) and deepening protest against the Vietnam war – climaxing in the Pentagon March of October 1967. In the UK, the economic situation worsened, culminating in the devaluation of the pound in November. The Civil Rights dream was over and Swinging London was long gone. The emerging drug culture was extremely divisive on both sides of the Atlantic, as was the increasing youth political consciousness. Pop culture was beginning to move beyond simple consumerism into an expression of a deep drive for change. In the UK, the establishment and the police woke up to the existence of the drug culture, with several high profile arrests including Mick Jagger and Keith Richards. Their trial in July became the UK pop culture event of the year. Although its use within pop culture had begun in earnest during 1966, LSD was still an underground thing. In 1967, it burst open. You can hear it in some of the singles on this compilation: ‘Levitation’, ‘I’m Five Years Ahead Of My Time (“I’ve unlocked the door to life’s mystery”) and ‘Revolution’ (“All we want is peace to blow our minds”). At the same time, Rex Garvin’s ‘Believe It Or Not’ acts as a sharp warning against the drug’s dangers, while the Shag sarcastically resist the peer pressure to indulge. Reflecting this turbulent and riven time, the track listing for this version of 1967 ranges between Tamla, Stax soul and the beginnings of funk, as well as mainstream white pop, white soul, West Coast and psychedelia. There is an openness and expansiveness in many of these records: a good example is the Young Rascals’ ‘Groovin’’, a US #1 and a Pirate Radio favourite in the UK, with its easygoing feel and summery bird noises, or the Supremes’ mind expansion move, ‘Reflections’, with its weird oscillations and laidback groove. During 1967, the single was still a vital pop form: you can hear in some of these records the complexity that would soon be spread over 40 minutes on an LP – as well as an earthy simplicity that was the reaction. Many of the 48 singles here were ones I heard on Radio Caroline South that year: I was an obsessive listener, making lists that were extremely helpful when putting together this compilation: I would never have remembered William E, the Picadilly Line or the Fortunes otherwise. i remember standing beside the record racks summer 67 lookinat the sgt pepper,sleeve which had no hit singles on it,also it was a few weeks old so it wasn't really new. i think in the end i think i bought a kinks marble arch album[it had a colourful flashy car on yhe front]...i probably bought a single with the change.